For Lola's recent Mickey Mouse themed birthday party I made a piñata - a Mickey Mouse piñata, of course. I'd made a papier mache piñata in the past but this was my first time making a cardboard piñata. 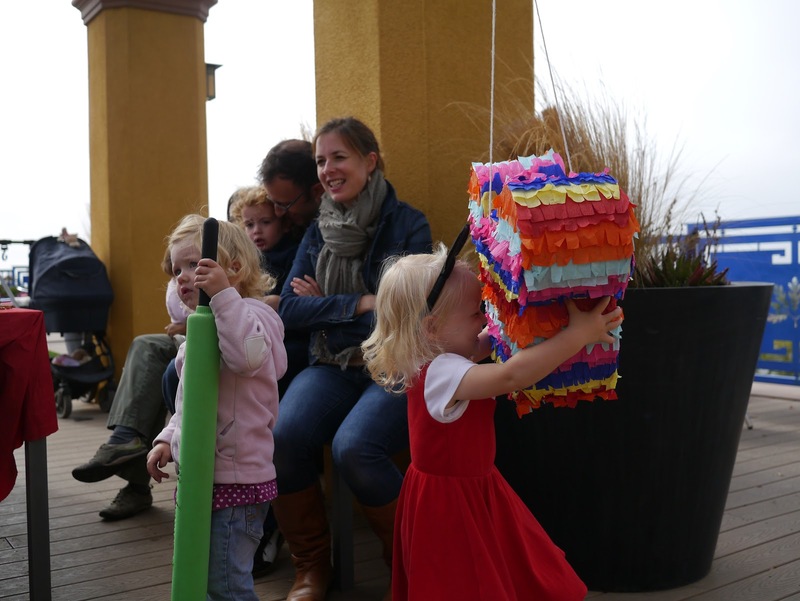 I must say, cardboard piñatas are much easier and less time consuming to make than papier mache piñatas. No worries about balloons popping, no waiting for layers to dry, no layers for that matter! Cardboard piñatas also open up a world of shapes that are just not possible with papier mache and a balloon, for example the traditional donkey shape. It only took me two evenings to make the cardboard piñata from scratch. Large pieces of fairly thick cardboard - I used a vacuum cleaner box. I originally planned to used an Amazon shipping box but it was just a little too thick. Some thinner cardboard. Cereal boxes are perfect. Something to trace around to make your shape - unless you plan to draw it freehand. 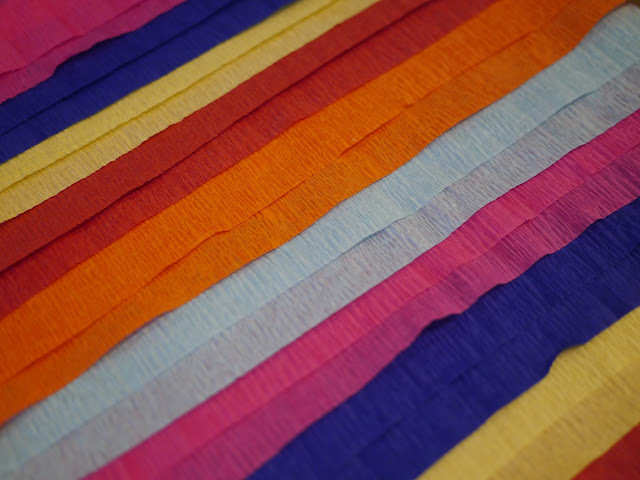 Crepe paper (sheet for covering the piñata and streamers for decorating). 1. The first step is to plan out your shape. I made a Mickey Mouse head shape so I scoured the cupboard for round bowls of the right size to trace around. I found a large round mixing bowl (31cm diameter) plus a smaller glass bowl (15cm diameter) that worked perfectly for the ears. 2. Trace around (or draw) the shape for the front and back onto your thick cardboard and cut it out. I made the head and ears separately as they fit better on the cardboard that way. If I'd had a larger piece of cardboard I would have traced out the design as a whole. If you go for the latter option, trace out one side only, cut it out and then use it as your template to trace out the second side. This way you'll ensure that the ears are in the same place. I used a craft knife to cut out the design as the cardboard was too thick for scissors. I scored around the edge of the design very lightly with the craft knife first to ensure that I had it nice and neat and then I set about "carving" it out. 3. 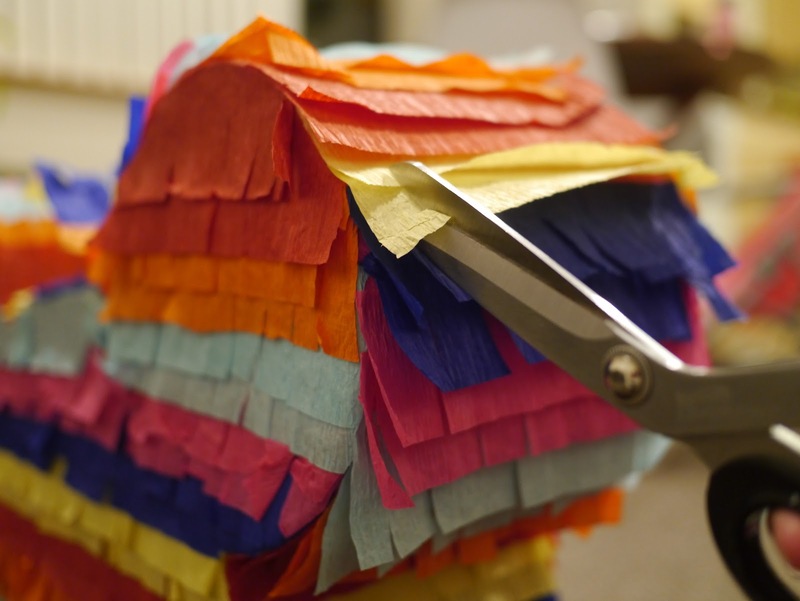 Now you'll need to work out how thick you want your pinata to be. I decided to make mine 15cms thick as it seemed like a good proportion and would fit a decent amount of candy. 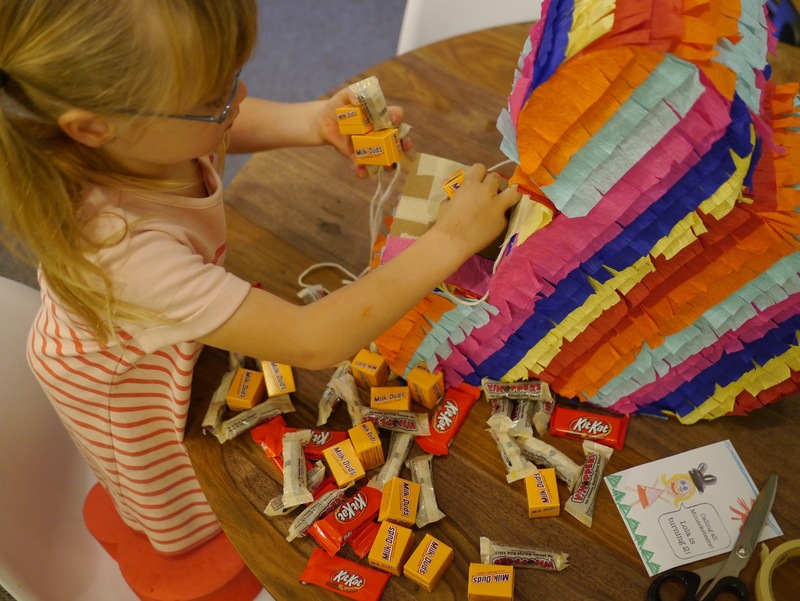 I cut out 15cm wide strips of cereal boxes until I had enough to go around the whole piñata. This used much less cardboard than I expected. I only needed 2 cereal boxes for this part. I didn't worry about avoiding folds in the cereal boxes as I knew that it would all be reinforced with masking tape once assembled. 4. 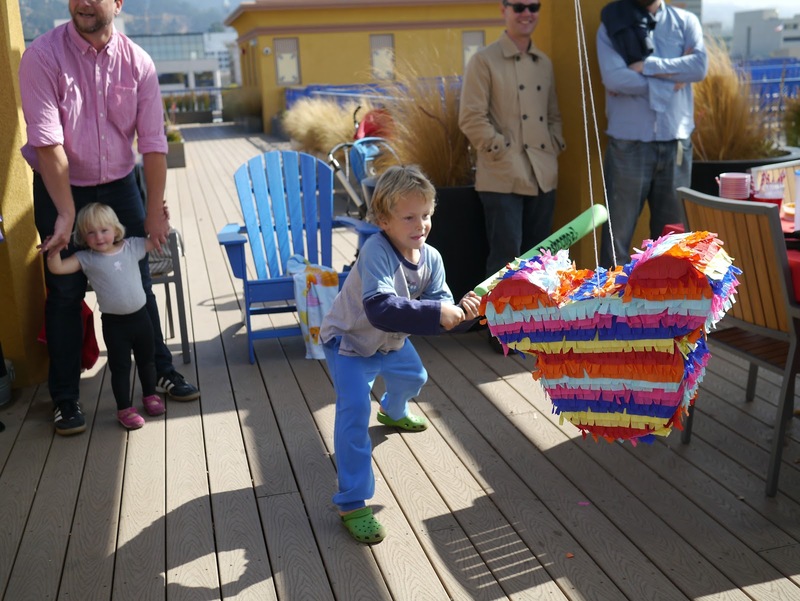 Now you can start assembling your piñata. I started by taping the thin cardboard around the edge of one piece of the thick cardboard. 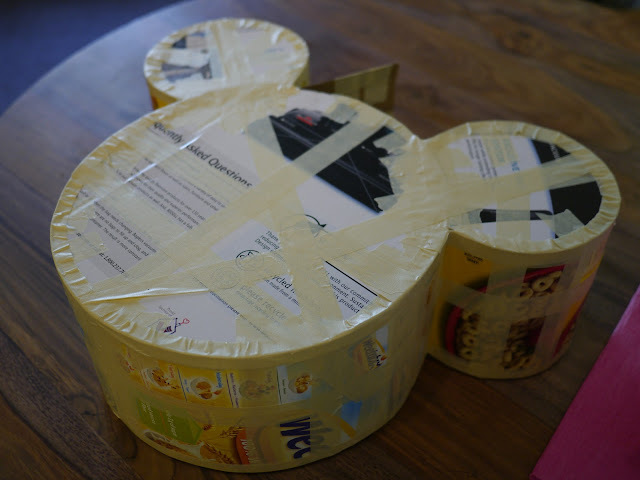 Once I had it all taped together I put the second piece of thick cardboard on top and taped all the way around again so that it became a three dimensional Mickey Mouse head. I used a lot of masking tape to reinforce it as I went. 5. Make sure that you leave an opening at the top while taping on the thin cardboard. I made a flap that would overlap in the very middle of the top when closed. 6. Now is probably a good time to make holes for your string. I did this step last and it was a little fiddly so it's best to do it now before the piñata is decorated. I originally planned to poke the holes through the thinner cardboard on top so I reinforced it with a few extra layers. Of course, this wasn't such a good idea in hindsight as it put too much stress on the masking tape holding the top and sides together. I ended up poking holes through the much thicker sides instead. I poked one hole on each side and crossed the string through the middle. 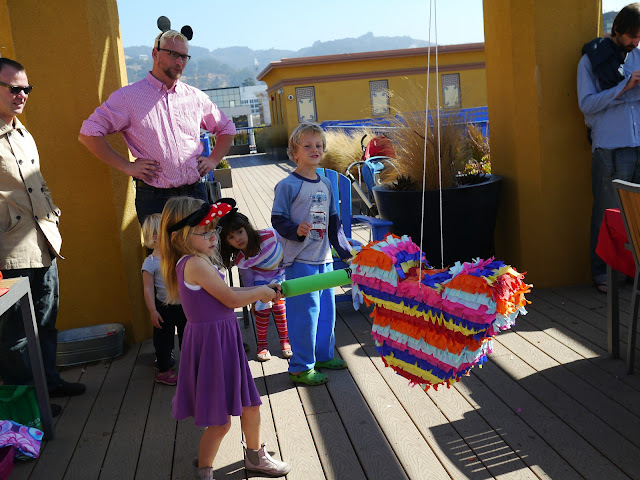 If your piñata is a little heavier or you think your cardboard may be a little on the thin side, I'd go for threading the string through two holes on each side so there is less stress on one point. 7. Once the string is attached you can fill the piñata with candy. 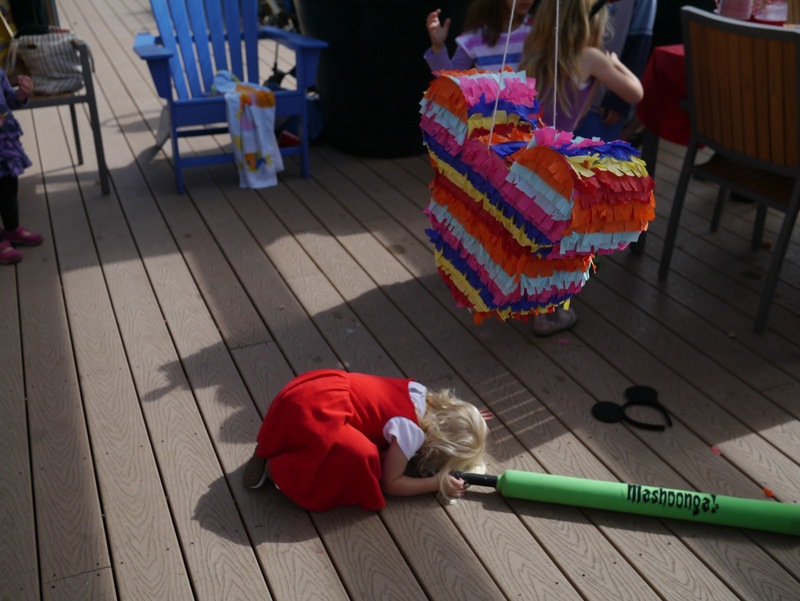 I like to use wrapped candy pieces seeing as they are going to spill all over the ground once the piñata is smashed open. I usually avoid chocolate as it's likely to melt although I did use mini Kit-Kats this time. 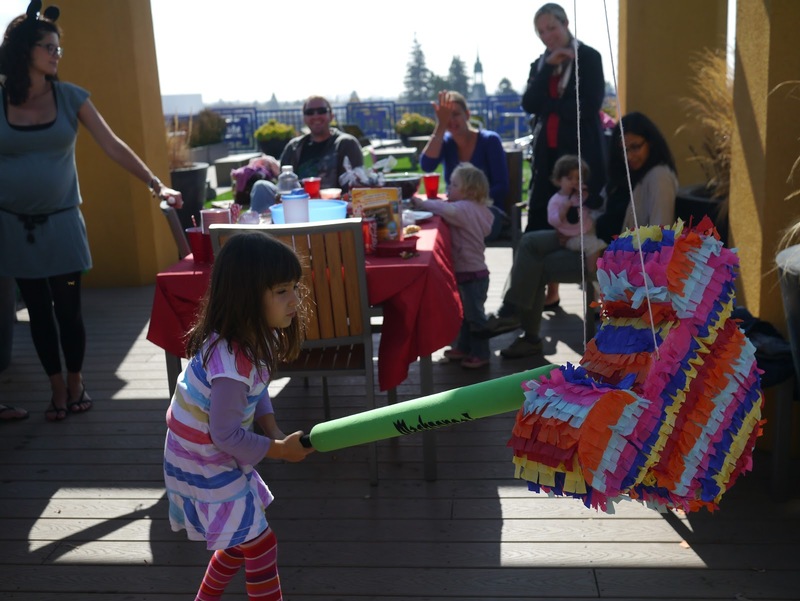 I figured that the mild weather we have here in the Bay Area is much less likely to melt chocolates inside a piñata than the hot weather back home in Australia. 8. You can can close up the top of the piñata with more masking tape. 8. Now for the fun part - time to start decorating. I started by covering the entire piñata in pink crepe paper so that none of the cardboard would show through. You could paint the pinata instead if you prefer. I used Clag paste to attach the crepe paper but I think next time I'd use something a little more on the dry side, like a glue stick. 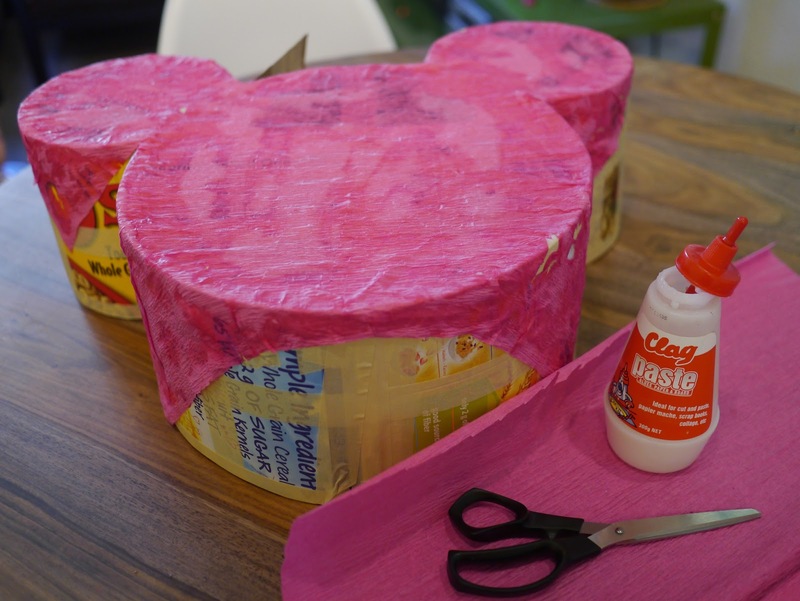 It's best to apply the glue directly to the cardboard and the place the crepe paper on top. If you apply the glue to the crepe paper instead it is more likely to stretch and tear. Once the piñata was covered (and the glue dried) I started applying colourful layers working from the bottom up. I used rolls of crepe paper streamers for this. I tried a few techniques for applying the streamers before I worked out the fastest and easiest. 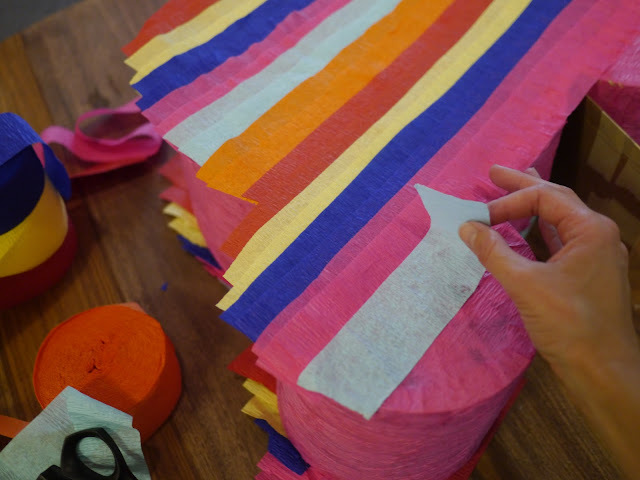 The best technique I found was to apply a line of glue directly to the piñata and roll the crepe paper streamer over the top, trimming it at the edge. Make sure you only apply the glue where you'd like the top of the steamer to be attached. You want to have most of the streamer loose to give it texture. 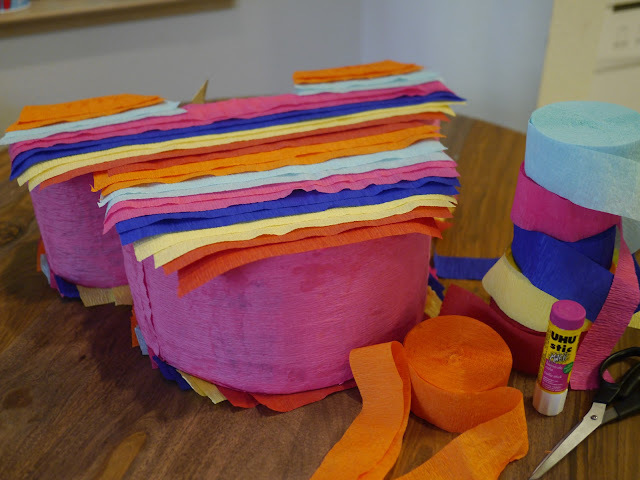 Apply the next layer so that the bottom of the streamer covers the top of the previous layer. I rolled layer after layer in the fashion, alternating colours after every second row until I reached the top. 9. 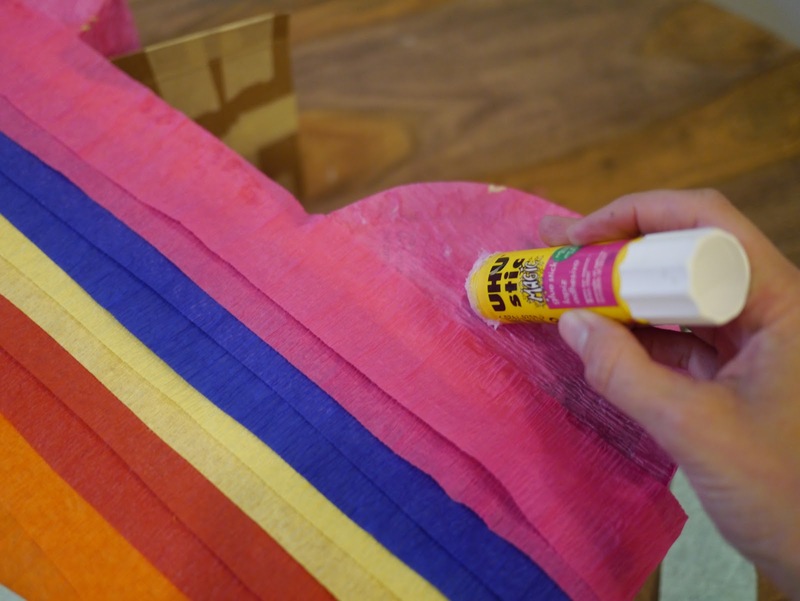 Keep decorating with layers of streamer until you have covered the front, back and sides. I did each side separately but you could roll each layer all the way around if you prefer, although I think this may be a little fiddlier. Front and back all done. Time to decorate the sides. 10. 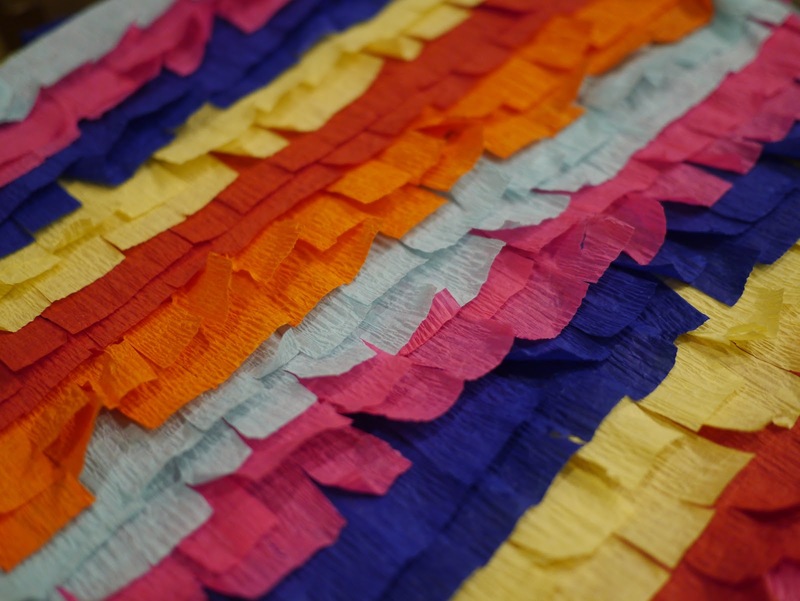 Once the piñata is completely covered in layers of streamer it's time to start snipping into it with scissors to create a fringed look. This is much faster than it sounds as you don't need to be precise with the placement of the snips in the streamers. You don't want it to be too messy but you don't want it completely even either. I used my sewing scissors for this as I found that the crepe paper tended to tear with regular paper scissors. Once I had snipped all the layers of streamers I messed it up gently with my fingers to give it a little more texture. Be careful not to rip the streamers when you do this. Now, you'll probably notice from some of the photos that I made the mistake of completely covering the pinata with decorations before I filled it, attached the string and sealed it up. This is what happens when you're up at 2am working on party preparations! I was on a roll with the decorating and forgot to stop! I may have also been distracted by television ;) When it came time to seal up the piñata I had to remove about 4 layers of crepe paper from the top, tape the box down and then reapply the crepe paper streamers. It wasn't a huge hassle but it could have easily been avoided had I paid more attention to what I was doing. 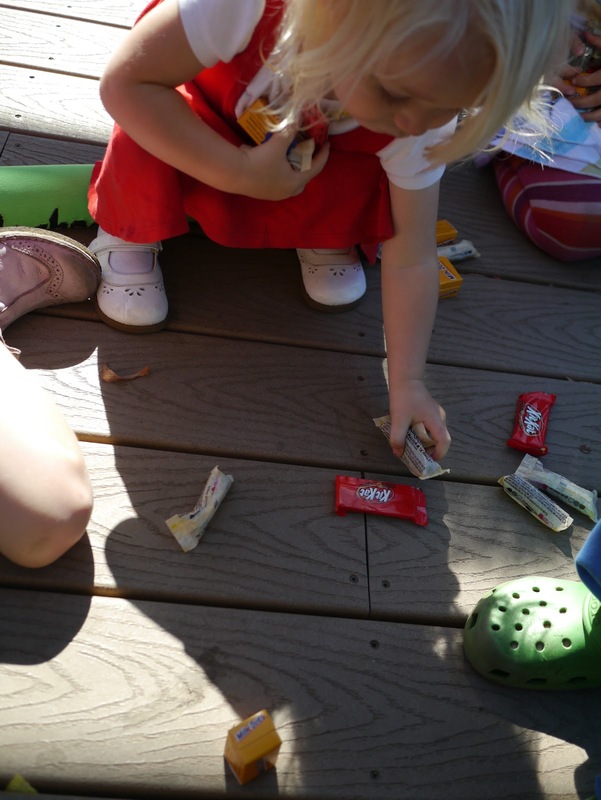 Lola tried to squeeze the candy out! It was all a little much for Lola! ...and even more big kids. 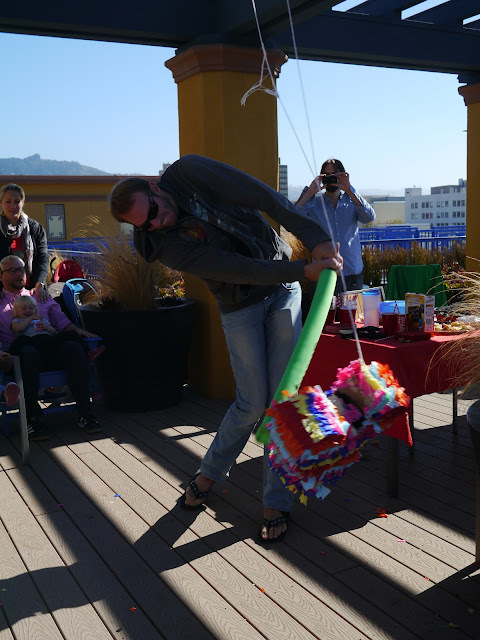 This piñata turned out to be quite strong and it took a little while for it to be broken open. In fact, the kids weren't able to break it open on their own despite their best efforts so we had to call in the big guns: the adults. 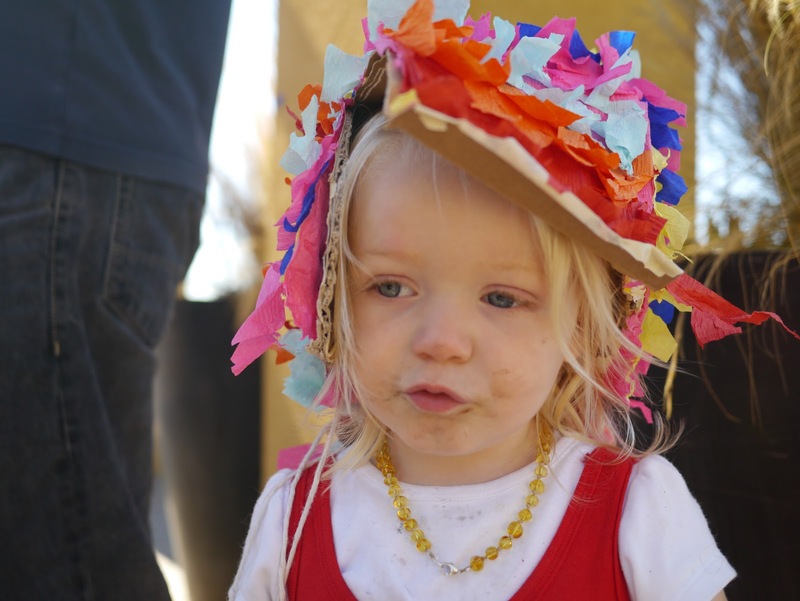 Lola wears her piñata hat! I am in process of making this project it is a lot more work than anticipated, already 3 hours into it and the steamers are not even put on. 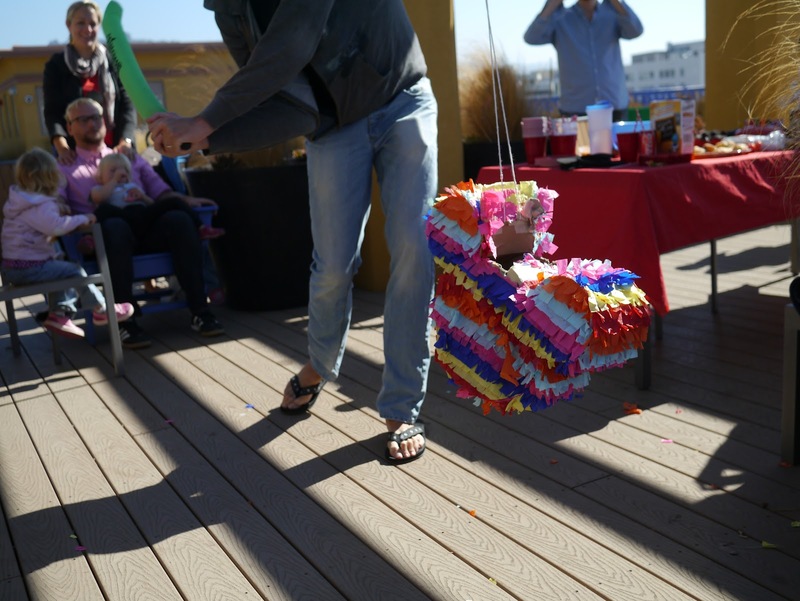 My husband wanted me to give up and to buy a piñata at the dollar store which is over $30,00! So tomorrow hopefully I will finish by tomorrow. It is lengthy project but our children are so worth it! Thanks for your feedback. 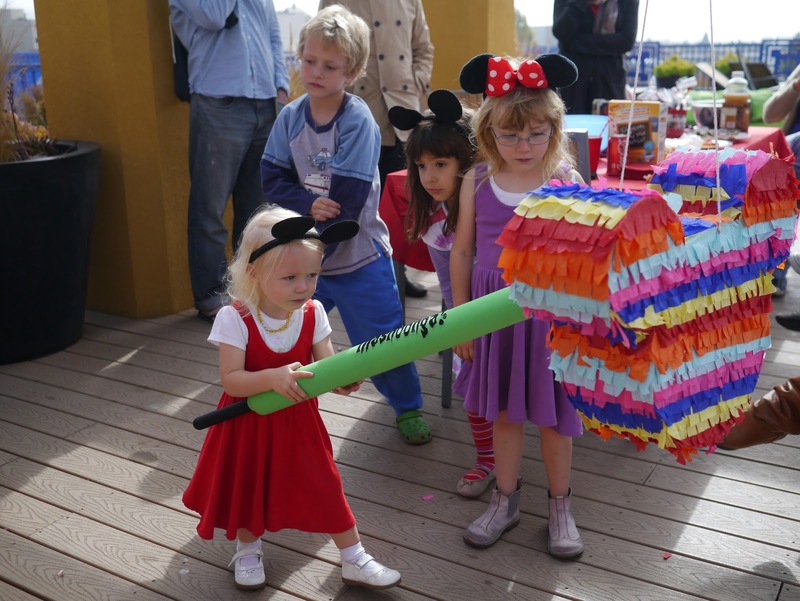 I would love to see how your piñata turns out. I seem to recall that I made most of this piñata in one night. My oldest daughter was keen to help out with the filling part the following day so I finished it the following evening. I made my piñata with mostly materials I found around the house so the only thing I had to purchase for mine was the crepe paper, streamers and candy. I can't remember how much this cost but I can't imagine it was much more than $15 or so. What size bowl or what did you make. 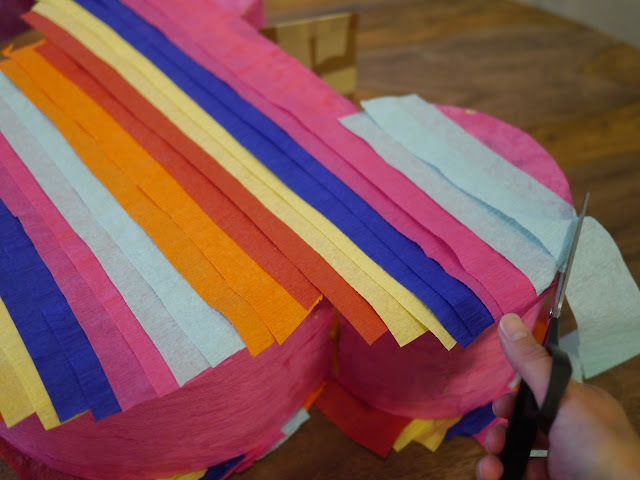 I have made a much easier pull string piñata, just use a square box and print the design of the theme and glue it to the front after putting all the streamers on. All you need is the box, some streamer paper, string to pull and a washer for the actual 'trigger' string. And it cost me about $5 to do! 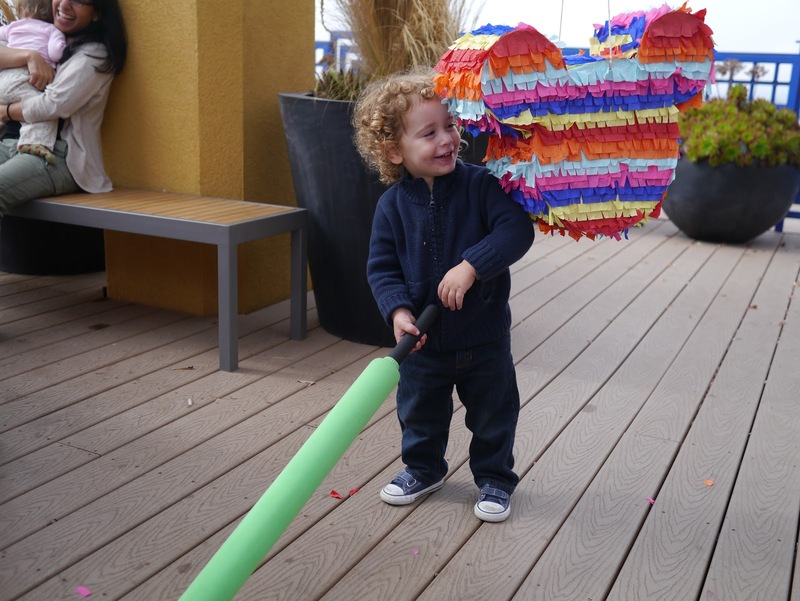 Check pinterest or similar for a pull string piñata, great for the lil ones who cant quite break a piñata yet also. I have made a joker to spidermans a regular spider-man and venom Spiderman and now I'm going to make a Mickey Mouse Clubhouse one and I'm going to make a star cowboy pinata.. each have only cost me around $10 and $6 candy. . Also excited to try ur method for Mickey mouse.